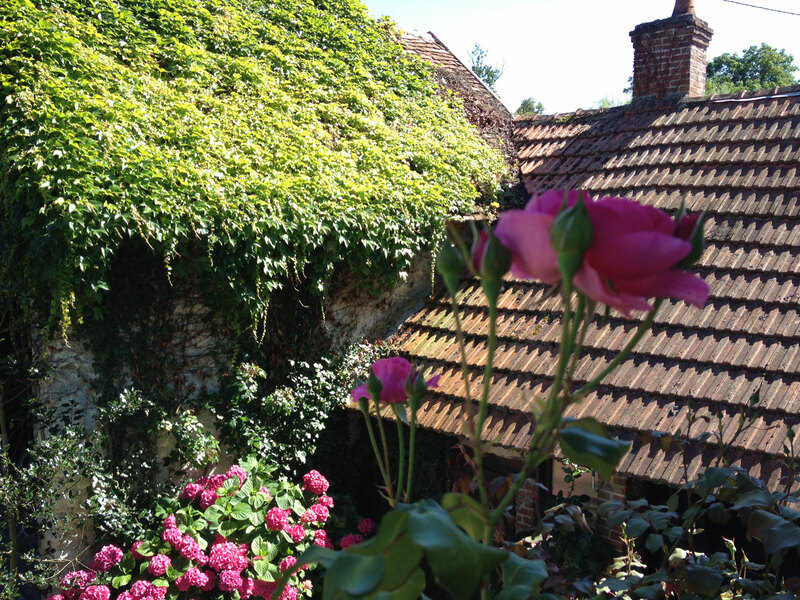 Each time we go to Blois, we fall in love with the garden again. In June, we had masses of honeysuckle and roses. Now the outside fence is lined with light and dark pink hollyhocks. The view as you drive down the street towards the house is quite spectacular. Inside, the prettiest flowers at the moment are the deep pink hydrangeas. These extraordinary flowers range in colour from a bluish mauve to light or dark pink depending on the aluminium content of the soil. They’re extremely popular in Brittany, where they are usually mauve. We have several bushes in the front garden and nearly a whole wall of them at the side of the house near the bread oven. 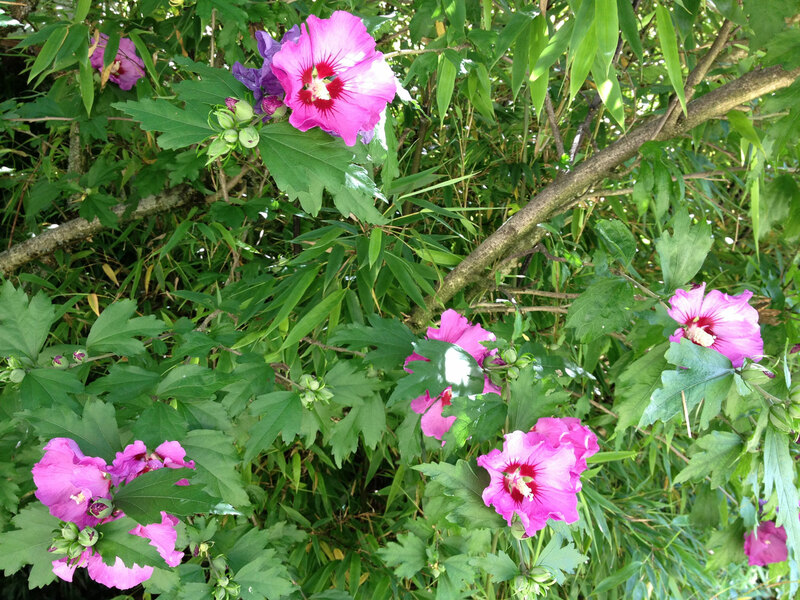 The other flower just coming into bloom is the Rose of Sharon, which can be white, pink or mauve. We have one of each! The flowers themselves look surprisingly like hibiscus but the leaves are different and they can grow into quite a large tree. The genus is actually hibiscus syriacus. In French, they are known as altheas. Hollyhocks come from the same family. Our grape vine is producing large bunches of black grapes but Mr Previous Owner told us that the ones that manage to escape the birds aren’t very tasty which is a pity. The wisteria is growing like crazy and still flowering. Our trumpet creeper seems to be a lot later than most people’s and its lovely dark orange flowers are only just coming into bloom. Next time we’re in Blois, I imagine the whole vine will be covered. It looks wonderful on the side of the little half-timbered tower on the far corner of the house which also has a tall hollyhock in front. The two rose bushes we bought from the Orchaise Priory are coming along well. They lost their roses quite quickly after replanting, but we pruned as instructed and there are lots of new buds. We have a lavendar bush in flower next to one of the them. The roses on the front steps had totally disappeared but are about to flower again as well. And do you remember those potatoes we planted in the rain in May? Well, we ate the first batch this weekend. 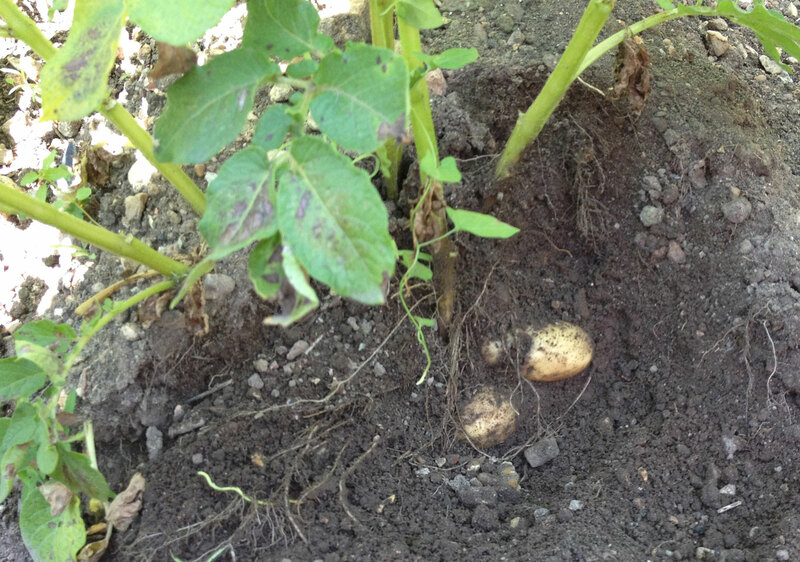 Just one plant produced about 10 medium potatoes. We were a bit disappointed though because they’re a little floury. We prefer the sort you bake in the oven. So Jean Michel dug a new patch of ground and we planted some organically-grown ones that we really like and that had sprouted during our two-week absence. They should be ready for picking when we get back from Australia in mid-October. 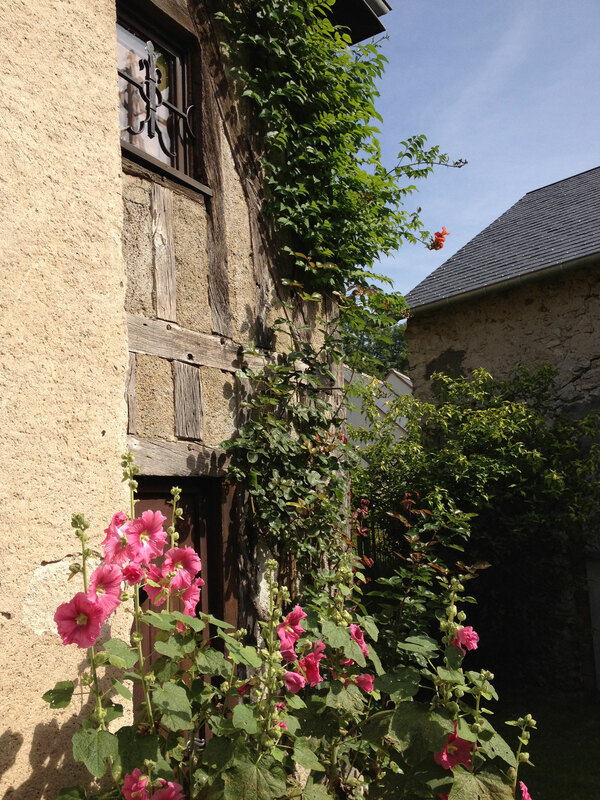 This entry was posted in Flowers & gardens, Loire Valley and tagged hollyhock, hydrangeas, potatoes, Rose of Sharon. Bookmark the permalink. Hi Fraussie, the garden is lovely, the hortensias look to me like our Hydrangeas, which are different colours depending on the soil. You can water the common one with tea and it changes the colour, but now we can buy special ones that won’t change colour. They grow much, much better in Toowoomba, than Brisbane. Yes, they’re hydrangeas of course and not hortensias! In French, “hydrangée” usually designates the Hydrangea petiolaris or climbing hydrangea, which has small white flowers, and I tend to mix up the words. I was told about another way to make the flowers change colour – broken slate – and someone else suggested tea leaves. We can get the slate from a “slate forest” near Angers that I mentioned in another post (http://www.aussieinfrance.com/2011/12/a-barge-on-a-cycle-path-in-the-loire-valley) and the tea leaves are easy! I’ve only ever seen hollyhocks in the northern part of France and in England, so I guess they don’t like the heat. I hope your daisies work. We have tiny wild daisies in the garden of the little house. I always love your blogs . Not only are they so enjoyable & informative to read, I like to relax and look at the great photos as well. Lovely to read whilst I’m sitting on my front deck lapping up the sun in winter in the tropics! I’m glad you like them, Butcherbird! Enjoy the tropical winter. I love your garden too, Fraussie. It really is delightful. I think the hydrangeas are particularly impressive. 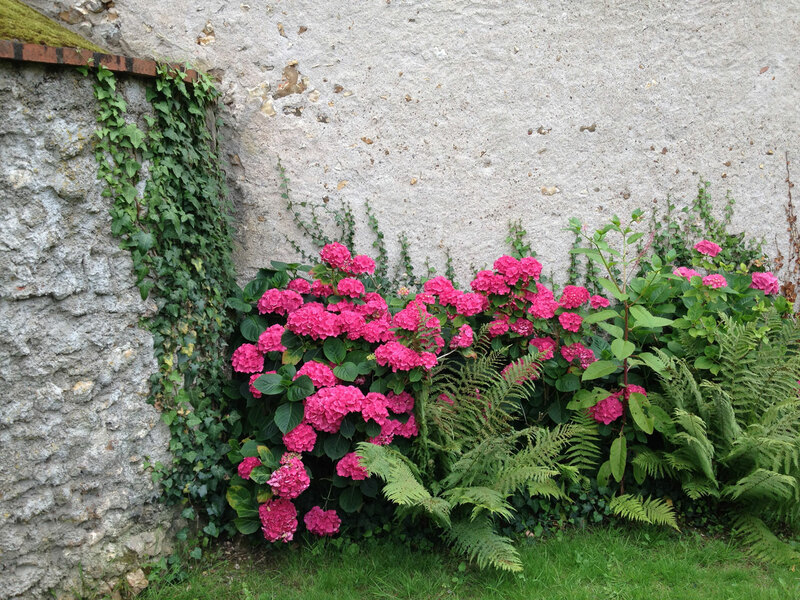 My neighbour has a small pink hydrangea growing in a pot which has just finished flowering – not bad for the tropics! I don’t have much luck with my gardening efforts. My basil has just died! (poison spray on the wind?) and some pest is eating all the new shoots on my parsley, while it is a race between me and the possums when the paw paws begin to ripen. C’est la vie! I was stunned when I saw the hydrangeas too. I have never been very successful with basil either. I think the secret is always to grow things that do well locally. I can remember Mum trying to (unsuccessfully) grow strawberries. In the garden of the little house, we have wild strawberries but something is eating them before they ripen. My raspberries haven’t give much fruit yet but they should do better next year. I hope so because I love them!